We all know the Double Dip case that has been available for the HTC One that was launched last year. This Double Dip case has different colors at the top and the bottom and the left over body in another color. Now this case can be fully customized by the users and they can pick up the color combination they want. Not fully, but still HTC is trying to mimic what the Moto Maker does for the Moto X buyers, but this is post-purchase. Whereas with the Moto X customization, it was on the back panel and not on the case. This Double Dip Case has three different parts that can be colored, attracting many of the HTC One users to this Customizable Case. The three parts are the top, bottom and the rest of the body as you can see in the image. The colors available are named as Glacier Grey, Neon Lemon, Atlantis, Bright Peach, Navy Blazer, and Pastel Blue. This is a limited set of color choices given to the users but still you can customize it on your own! 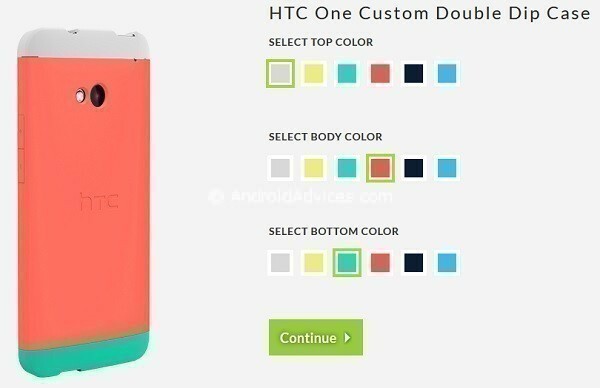 This Double Dip case can be bought from the official HTC site, where you have the option of customizing the Double Dip Case. The options of Select top color, select body color and select bottom color can be seen where each option has 6 different colors. These colors can be selected and seen how they look and then the user can select the correct combination they want and continue. They can also see how this color combinations looks, so that they can alter their option if they don’t like it. This customizable Double Dip case is available for $29.99 and you can customize it as you want by hitting the link here. Moreover HTC is trying to attract its customers and giving them wider options to increase their market. We also know that HTC is planning come out with its latest flagship, successor to the HTC One called as the HTC M8. So what are you waiting for? Just hit the source link given, customize, buy and use it on your HTC One. Stay tuned for more updates and information and do comment.